The after effects of BEA rest squarely in my shoulders and upper arms this morning. It’s that lovely kind of sore that you get from carrying around three tote bags full of free books for eight hours. For those of you who have been to BEA before, this lovely soreness is nothing new! You’ve probably learned already to be picky about the free galleys that you haul around all day. 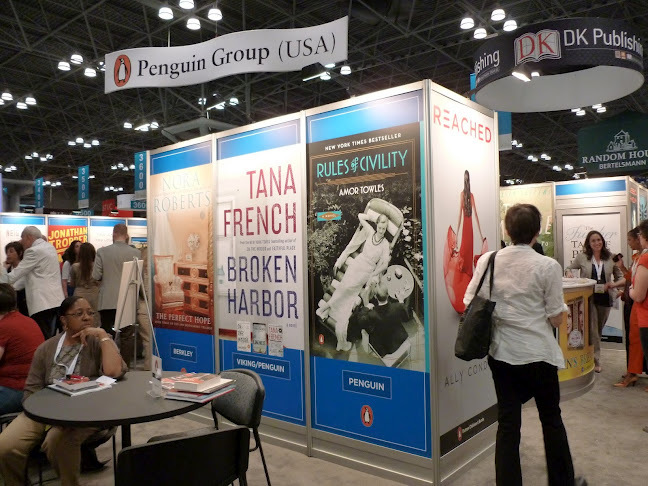 But since this was my first BEA experience, I ran around like the poor, eager publishing student that I am, fighting the crowd for every free book in sight. I grabbed young adult fantasy novels, historical fiction, and espionage thrillers without discrimination. Today, as I massage my sore shoulders, I think of my bookshelf at home with a happy anticipation. It was more than worth it. Getting to the Javits Center by 7:30 AM was also well worth the early morning subway ride. I got to start the morning off right – with a cup of coffee, a muffin, and Stephen Colbert making erotica jokes. Stephen Colbert was the Master of Ceremonies at Tuesday’s Author Breakfast, and he wasted no time in publicizing his ‘upcoming #1 bestseller,’ America Again: Re-Becoming the Greatness We Never Weren’t. He also took great delight in celebrating the success of 50 Shades of Grey and the apparent public acceptance of erotica novels (I’ll let your imagination fill in the rest). The speakers at the breakfast were the inspiring Junot Diaz (This is How You Lose Her), the charming Barbara Kingsolver (Flight Behavior), and the hilarious Jo Nesbo (Phantom). Their thoughtful and often hysterical talks were without a doubt the highlight of my BEA day. Another highlight was walking through the crowded exhibit hall and, on more than one occasion, running into people I knew in the publishing industry! Between running into fellow Women’s National Book Association members, members of the Book Industry Guild, professionals I met in my internship, writers I met at events, and other Pace students and faculty, I experienced the very real benefits of networking. BEA’s panels were excellent, the exhibit hall was overstimulating, and the accidental discovery of free Italian cookies and glasses of champagne was the icing on the cake. But what meant the most to me yesterday was the feeling, which built throughout the day, that I’m a part of something important – a community of publishers and authors, of men and women, of like-minded readers and professionals. A book community. Not bad for my first BEA. Next time I’ll bring a rolling suitcase.